Without the use of digital free table planner tools, it can be difficult to both envision your event ideas and accurately design floorplans. Many questions remain such as how will the actual furniture, tables, tabletop items, and decor placement really work in the event space? Will our ideal layouts fit and flow well for the event? Will the client be happy once they see the final product? AllSeated removes this uncertainty through the use of our to-scale 3D floorplan diagramming, free table planner tools, extensive furniture library, designer tools, and virtual reality capabilities. Our collaborative planning platform make it simple (and fun!) to accurately place furniture and arrange seating within the floorplan diagram. Easily select from a wide variety of table shapes and dimensions from AllSeated’s extensive furniture library. Make use of our free table planner tools including the ability to customize the spacing between tables, the number of chairs around each table, join tables, knock off chairs while also being able to list table numbers and create table assignments. Arrange lounge furniture, place tables, the dance floor, buffet stations, bars, and anything else you wish to include in the diagram too!! While designing your floorplan diagram, you can switch views from 2D to 3D to take a tour of your floorplan. 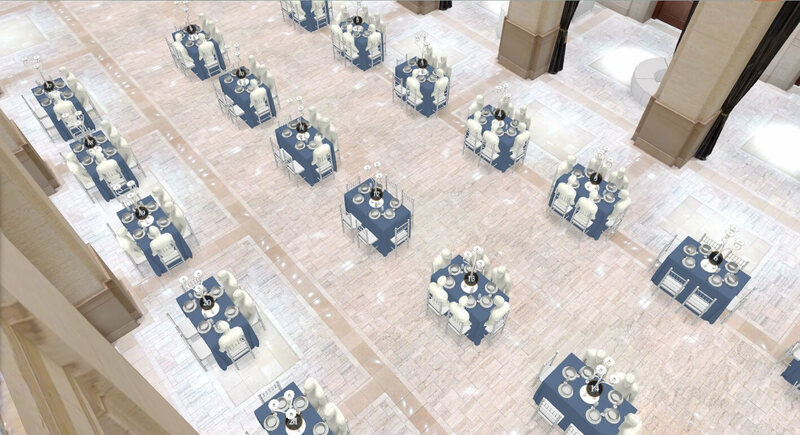 Using AllSeated’s 3D viewing, you are able to create a virtual walk through of your event. Each piece of furniture and tabletop item is designed to scale with the exact listed dimensions. AllSeated’s free table planner tools have taken all of the guesswork out of wondering if everything will actually fit in your event space on the day of the event. AllSeated is constantly developing new tools and free table planner features specifically designed to drive business growth and ROI for our loyal user community. Experience an event before it even happens using AllSeated’s Virtual Reality! Using AllSeated’s special VR goggles, virtually tour a future event layout in a realistic simulation. Virtual Reality tools assist in selling a venue space and related services to all potential clients. VR capabilities provide an environment for visions to be created and ideas to be generated in advance of an actual event. Learn even more about AllSeated’s Virtual Reality in this video along with the three easy steps for getting started here! As part of your free table planner tools, AllSeated’s designer tools allow you to build tabletop and buffet displays to-scale within your floorplans. Watch this quick video! Using the designer tools as you are now able to see exactly what you can fit to-scale on tabletops, which means no more guesswork! The options for the table builder and buffet designer tools currently currently include place settings, flowers, centerpieces, linens, and buffet pieces, with many more objects to come.